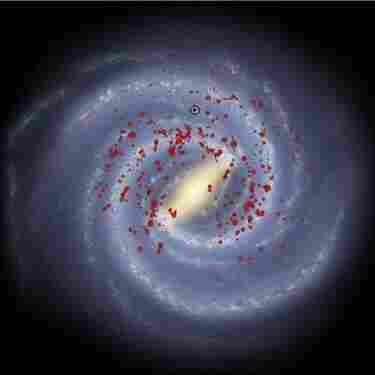 New Research Affirms That Milky Way Has Four Spiral Arms : The Two-Way A study in the U.K. reaffirms a view of our galaxy held in the 1950s that was later challenged by images from the Spitzer Space Telescope. Our Milky Way galaxy has four arms instead of two, according to just published results of a 12-year study by scientists in the U.K. The findings, published in the Monthly Notices of the Royal Astronomical Society, affirm what astronomers surmised in the 1950s but began to doubt in 2008 after seeing images from the Spitzer Space Telescope that could only confirm two spiral arms. Unlike our view of other galaxies, it's challenging to figure out from our inside looking out vantage point what the Milky Way looks like. Our solar system is thought to be located on one of the spiral arms that jut out from the massive central core. "The 12-year-long study of massive stars in the Milky Way conducted by Red MSX Source (RMS) survey led by University of Leeds astronomers scoured the galaxy for massive young stellar objects, which are uncommonly large. These massive stars [live] shorter lives than their lower mass counterparts, which astronomers utilized when conducting their survey. As these massive stars die relatively quickly, they are only found in the arms of the galaxy where they formed; they have no time to move elsewhere." "Research done in the 1950s concluded that our galaxy has four spiral arms, based on the clouds of gas in which new stars form. But a later analysis by the NASA Spitzer Space Telescope that scoured the Milky Way with its infrared scope revealed about 110 million stars, but only evidence of two spiral arms." "It isn't a case of our results being right and those from Spitzer's data being wrong – both surveys were looking for different things," Professor Melvin Hoare, a member of the RMS Survey Team in the School of Physics & Astronomy at the University of Leeds and a co-author of the research paper, said. "Spitzer only sees much cooler, lower mass stars – stars like our Sun – which are much more numerous than the massive stars that we were targeting," Hoare said. "The Milky Way is our galactic home and studying its structure gives us a unique opportunity to understand how a very typical spiral galaxy works in terms of where stars are born and why."